prods us into taking helpful and positive action. What you’re full of is courage, not fear. I’m not saying that I never feel fear. I do, and on a regular basis. But it’s not the feeling of fear that’s harmful. It’s wallowing in it. Refusing to get out of bed in the morning; neglecting home, family, and responsibilities because you’re frozen in a cowering position. 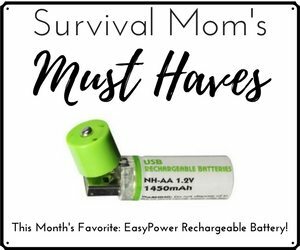 Survival Moms do not cower! We feel the fear, let it settle in, knowing it’s just a temporary visitor, and then brush it off. 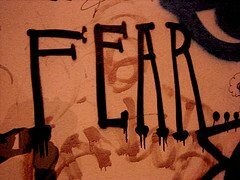 Once we’re past the fear, we can dangle it in front of us, look it over, analyze it, and then take action. 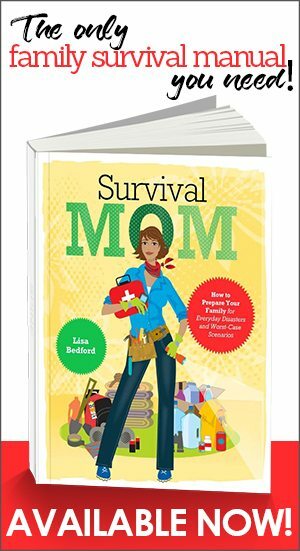 Our kids, husbands, and other loved ones deserve a strong Survival Mom, and just in case you’ve been feeling that maybe you’re not quite measuring up, trust me. You’re doing just fine. You know what to do. Even the smallest baby steps add up over time to significant measures, each step bringing your family closer to being prepared for whatever comes. Amen Lisa, we do not cower!!! I needed this post! 🙂 Thanks for the reminders in it! My friends say I worry too much. It is not me worrying, it is me trying to say things that will motivate them to get prepared. Yes, I am quite concerned about our future. But in the meantime I travel and enjoy life. I am one of the lucky ones, retired and pretty much prepared as one can be. I think the secret to life is moderation, be prepared but don't let it consume you, same with food, drink or most things in life. I think that the only thing that got us threw the late 70s and early 80s is the guy upstairs. I ask him quite often to get us threw this mess. Hopefully he will and I will never need any of the stuff in my store room. But I am not betting on it. Don, at some point, there's just no use in trying to persuade people. Almost no one in our extended family is remotely interested in preparedness, but we keep on doing what we know is important. Like you, we also enjoy life and take plenty of time off for fun. It's all about staying focused and yet, at the same time, maintaining a healthy balance. In my family, all the older generations. . . the forty-year old folks and older . . . are prepping like mad. Maybe it's all those stories we heard and still remember from our grandparents about the Great Depression, I don't know. The younger folks aren't doing anything, in part because they have young families and don't have a lot of money to spare . . . but also because they think we're all just being paranoid. My daughter even told me one day recently that God would just look after her when and if the economy goes bust, the dollar crashes, or some horrendous event destroys the pleasant world we know today. She implied that maybe I just needed to have more faith . . . hmmm. I reminded her of Noah and Joseph, but . . . she just rolled her eyes. Gets that stubborness from her DAD's side of the family, you know. I hope she doesn't have to eat those overly pious words someday, but feel like she probably will. I've been trying to gently talk to a project manager I work with about making financial preparations (e.g. gold) and he frequently says I'm just full of doom&gloom. Maybe I am but I see no good out come from where we are regardless of who wins election next year. "courage is being scared to death, and saddling up anyway"
A man in his car was stopped by a policeman for a minor traffic problem. As per the law, the man gave the policeman his license, proof of insurance, and his concealed weapon permit. The policeman asked the man if he currently had a weapon with him. The man said he did, and indicated the pistol tucked between the seats. The Policeman asked if that was all. The man said no, pointed to the backseat where he kept another pistol and a long rifle. Then he opened the trunk where he had several more firearms each a larger caliber than the last, and dozens of boxes of ammo. Somewhat surprised, the policeman asked "Just what are you afraid of?" The man answered "Nothing. Nothing at all." Being prepared doesn't mean you are afraid. It makes it so you don't have to be afraid. Our family motto is "Prepared, not scared!" There is a certain sense of security in knowing you've done everything you can to prepare for the unexpected. To those who say they're leaving it in God's hands, my Savior also gave me free will choice and a brain. I also think it's arrogant to ASSUME God will "take care of you." He does promise to take care of widows and orphans, but that's through teaching his followers to be charitable. I guess Manna could fall from Heaven, but why should it when I have the means to pre-pack it myself? I have to agree. I have a friend who is leaving everything up to God and I work for a woman who survived Auchwitz . One of them has food storage, one of them doesn't. Do you ever doubt the need to prepare? For about three years now, I've felt the need to *do something* to prepare for the storm I've felt was coming. My family and friends laughed at me when I prepared for Y2K and nothing happened. They laughed when I prepared for a pandemic (swine flu, bird flu, take your pick) and nothing happened. Now, my husband gets irked when I prepare or talk about the need to prepare. He thinks I'm spending money for nothing. Do you ever feel like just burying your head in the sand and waiting like all of the other sheeple? I guess I feel weighed down by this intuition that something is coming, but when years go by and nothing bad happens, I think that, perhaps, I'm worrying about nothing? Maybe I should just stop preparing for a future that never materializes and focus on the here and now? Yes, sometimes I'm tempted to join the ranks of the sheeple. When we're on vacation and I look at all the people just having fun and living life the way it's always been, oblivious to any future crises, it's very tempting to join their ranks. Last summer more than anything I wanted to just move to Park City and pretend that everything was okay with the world. So, yes, I can relate. Keep in mind that even if everything should miraculously turn out okay, there's nothing wrong with having extra food (you can rotate it into your meals and use it up), being debt free, maybe having some gold and silver, some extra water stored, growing some food….nothing goes to waste. The problem with Y2K for a lot of people is that they were preparing for, really, a single day, and when that day came and nothing happened, they didn't know what to do with what they had purchased and many felt foolish. Preppers are taking a much longer view and making preparedness a lifestyle. Don't buy anything you don't know what to do with. How silly! Buy what you can use, and use it. Buy a whole bunch when it's on sale. Use it as you go along, and replace it when it's on sale again. Never pay regular price again. If disaster never strikes it doesn't matter, it's stuff you use. It's not wasted. Nobody can complain that you threw anything away. I can't even imagine passing by the opportunity to buy 2 cases of canned tomato products when they go on sale nearly half price. Katy your feelings are normal. 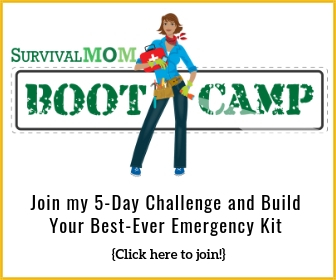 I first became aware of the need to prepare after reading James Wesley Rawles' book "How to Survive The End of the World As We Know It about two years ago. For a long time I felt this awareness of the need to prep was a curse but now I view it as a blessing. I know it's hard when you have a spouse who isn't on board like my wife . I'm what you call a secret squirrel. When I talk to people about the need to prepare most people laugh and say "If something happens I'll just come to your house". I have made a lot of mistakes in prepping and have talked too much about this to people I shouldn't. The bottom line for me is that it is comforting to feel that I am taking steps to protect my family and know I have no expectations of getting help from my government. I actually don't even care when other people don't "get it". I'm not saying I feel superior to these people but I kind of feel sorry for them for being "sheeple". I wish you success with your preps. There is nothing wrong with using your intuition and preparing for a future crisis. If people you know are giving you flack because you are preparing all you have to do is tell them that being ready for, let's say, bad weather isn't crazy, it is logical. Let them believe what they will. Only G-d can change people and their hearts and minds. Just keep doing what you know is right for you and your family. No one can fault you for that. It doesn't mean you're going Sarah Connor on anyone. It just means you are smart. Thanks for the encouragement and kind words. I just start to doubt myself when the only people who seem to "get it" are all online. I don't buy a bunch of stuff that we don't use in our daily lives, but I find it's hard to rotate canned goods in a timely manner when we only eat one can of soup (or beans or fruit) a day or so. I feel as though I'm constantly fighting the expiration dates. I start to question myself. Am I looking for doom and gloom, like everyone says? We don't have many natural disasters where I live, so I can't claim that I am preparing for a hurricane or a tsunami or an earthquake. I just feel as though it's my responsibility as a mom to prepare my family, and I can't shake this feeling of "waiting for the other shoe to drop….." I guess I would feel pretty silly if I had these feelings and did nothing and then "it" hit the fan. Perhaps I should look at it that way…. There IS a lot of be concerned about in the country and the world these days. I do hope thing comes of it all but I also don't see a way out of it. None of our so-called "leaders" are doing a thing to address the base issues. Just more band aids on a series of shark bites. Canned goods are generally still good beyond their due date as long as they aren't rusty, dented or bulging. I have personally eaten soup that is 2-3 years out of date and it was fine. That's the reason for canning. I wouldn't go so far as to say it would stay good indefinitely because I feel they are using inferior products to make and line the cans these days, but you can certainly use canned goods beyond the expiration date. Katy You might want to tell your dh that even our govt tells us to be prepared. When I think about Fear I think about E. V. Rickenbacker WW l Fighter Pilot. Courage is doing what you're afraid to do. There can be no courage unless you're scared. 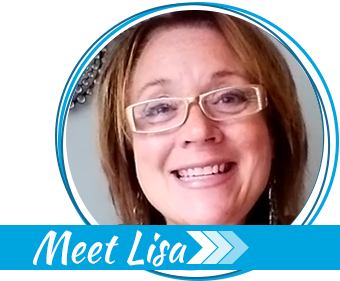 Lisa, my daughter is 24 and has a diagnosed anxiety disorder and all the meds to go with it. She can’t handle when I talk about even the littles prep. It sends her into a tailspin of panic, tears and weeks of stressing about the “what ifs”. Last night we suggested she fill her car up with gas because a lot of gas stations in the DFW are running out with Harvey’s flooding and the refineries being shut down. You can imagine where this led emotionall and then the question: “Will there never be gas again?” 😐 <<yeah, that was my look. I know she's not dumb and I think the question was really derived from that panic and fear even though rationally she knows better. So any suggestions on how to help her through BASIC preparedness would be great. My thought is she needs a therapist because odds are good in her lifetime she'll have to deal with this or something like it again.